Election coverage usually features a great deal of punditry, commentary, and far-too-early predictions of how states will go. Last night’s coverage didn’t disappoint. Flipping between major networks, including CNN, Fox, and MSNBC, viewers were treated to a multitude of interactive and real-time updated visuals and the accompanying commentary. This potential sensory overload did serve to keep political junkies entertained and glued to their screens until Governor Romney’s concession speech after midnight. Check out this screenshot from Fox News – the bottom of the screen featured a two-row multi-column results updater. It took a few minutes to get accustomed to how to interpret this data display, but it did do a decent job of constantly running through results as they came in. 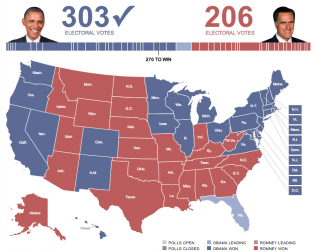 Generally, color-coding across the networks was consistent – states that went for Romney were red, states that went for Obama were blue, yellow indicated states that were too close to call, and states that were still outstanding were gray. All in all, it was an exciting evening, with a somewhat unexpectedly quick outcome. What did you think of the coverage? Previous Previous post: Still Undecided on Election Day? Google It.